Today was another great afternoon to run. It was a little warmer than yesterday but still very pleasant and low humidity. I ran 10 miles with 4 miles at half marathon pace. My splits were right on target, 8:05, 8:07, 8:02, 8:08. Felt real good about the workout. The last time I attempted a tempo run the temperature was in the 90s. The 15 degrees really makes a difference. August 31 is the end of the meteorological summer, but today felt more like Fall. The humidity was low and with the wind from the North, it was a very pleasant 70 degrees. It was a great afternoon for a 5 mile recovery run. Logged 192 miles this first month of training for the St. Jude Marathon. I could not stand the idea of an other idle Saturday so I headed to the Y today. I did 30 minutes on the elliptical machine and 30 minutes on the bike, twice and then 30 minutes of pool running. My legs were tired by the time I finished but my calf did not hurt. Michele, I’m trying to keep up with you. Hopefully, I will not be too far behind! I have continued to struggle with discomfort in my right lower leg. It has been a cycle. I would feel fine. Run. Hurt. Hobble around for the rest of the day and half of the next. The discomfort would go away and then I would run again. My mileage has taken a nose dive in the last three weeks. Wednesday morning I was feeling the after effects of Tuesday’s 7 miles. So, I decided enough and called my GP to at least start the process of hopefully getting some resolution. The Doctor measured my calf, it is not swollen, and poked around my knee. He ordered an ultrasound to make sure it was not vascular. The test was negative. So, he referred me to the Orthopedist. This morning I had the appointment. He asked a lot of questions. Said my knee was slightly swollen and order x-rays. Nothing. Knees are good. The bottom line, I have strained or torn the right calf muscles. For the near term, I need to focus on cross training. But he could not say for how long. I just need to be careful and not try to come back too soon. I was hoping for a silver bullet, in that the Dr would say, “Oh, your problem is x. Do y and z and you will be back to normal.” Instead, it will be cross train and come back slowly. It is looking like Tom King is iffy at best. I’m still holding out for Country Music Half but I don’t know about the Pig. I’ll just have to see and hope the cross training will keep up my fitness level. This afternoon I experienced pool running for the first time. I spent an hour going in a small square. I hope the healing comes fast! It is Saturday morning. I should be out running. I want to be out running. I need to be out running. But here I sit. For the past month, I have had some discomfort around my right knee. At first, I thought it was in my upper calf. When I start to run, it would feel like it was going to give way and I would hopple for about 100m or so and then I was all right. As I warmed up, the discomfort would go away. But after running, it was difficult to go down steps. It would feel like my leg was going to give way. After Monday’s run, I decided it would be in my best interest to take a few days off. I have not been very successful in identifying the problem. The discomfort begins at the top of my calf behind the knee. Yesterday, everything felt fine, so I ran for a couple of slow miles. It felt better but the discomfort returned. I stopped by the house and put a pair of Superfeet inserts in my shoes and ran another mile. That seemed to help. Needless to say, I didn’t feel like doing a 17 mile run today was in my best long term interest. So here I sit. Hopefully, I will not be sitting much longer. I’m a little behind in my post for last week. I was out of town this weekend and didn’t get back until Sunday night. Went to North Carolina to visit Mom and Dad. Dad was recognized at his church Sunday for serving as treasure for almost 60 years! For the last few weeks I have had a nagging soreness in my right knee/upper leg. I can’t decide if it is my knee or tendons. When I start to run, I feel like I’m hobbling for the first 100 yards or so and then I’m all right. There is some discomfort when but it usually goes away as I warm up. After the run it is sore and tight and hard to go down stairs. For right now, I guess I’ll just keep babying it and see if the discomfort will go away. Maybe, I need to start taking Celebrex again! Monday, I ran 8 miles with 10 x 100m strides. Most of the intervals were in the 25 sec range. Tuesday was a recovery day, only 5 miles. I didn’t make it to the Y to swim because I wanted to watch the Inauguration. The streaming feed was choppy so I decided to eat lunch instead. Wednesday was a general aerobic run of 10 miles. Thursday, I did make it to the pool at lunch. I guess one day is better than not at all. Friday, I took a vacation day and ran 15 miles before flying to North Carolina. Saturday was a short but hilly 4 mile recovery run. The word for the week was cold! I hope this past week was our one week of real winter weather but in Middle Tennessee, you never know. I did manage to make it to the pool twice and keep up with the plan of three days of stretching and core. I finally put my money down for the race. With the price set to go up the end of the month, it was just a matter of time. So, now I’m committed! Monday was the speed day. Ran 8 miles with 4 at half marathon pace (8:01, 8:04, 7:56, 7:53). Tuesday, I swam at lunch and then ran 4 miles after work. Wednesday’s plan called for 10 miles. Thursday, was another trip to the Y at lunch. Friday, I ran 4 miles in 22 degrees. The overnight low Friday night was in the low teens. So I waited until the sun came up before heading out Saturday morning around 7. Later than I normally like. Once I got warmed up, didn’t really mind the cold. Here is a link to the splits. The temperature was in the single digits this morning. Even though we don’t have any snow, at least it feels “seasonal”. Today was the first day of vacation, so I pittled around the house today and ran errands and did some shopping with Gayle. Ran 6 miles this afternoon. It was in the mid-20s. Felt really good to be out running. With Sara and Laura working tonight, Gayle and I went out to eat. We are beginning to get glimpses of what it will be like next Fall when we have an empty nest. I still haven’t signed up for the Myrtle Beach Marathon. The race is filling up so I may not be able to get in. But I am waiting to sign up until I know that Gayle’s Mom is coming back to Tennessee with us after Christmas. I will be surprised if she doesn’t but her health is not that great, so we never know. I will not know for sure until December 30th. All that is to say, I am hedging my bets and am running as if I am going to race in February. I figure I can always back off if need be. This past week was wet and cold forcing me to the Y Monday and Tuesday to run on the treadmill. 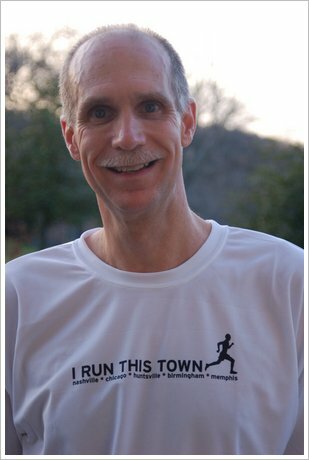 Wednesday, my girls gave me my Father’s Day present, a custom running shirt listing my marathon cities. Better late than never. One advantage of delaying, they added Memphis. Thursday, I ran 7 miles in the fog. It was so thick, I almost got hit twice and I have on my reflector vest. Saturday morning I ran 12 miles. 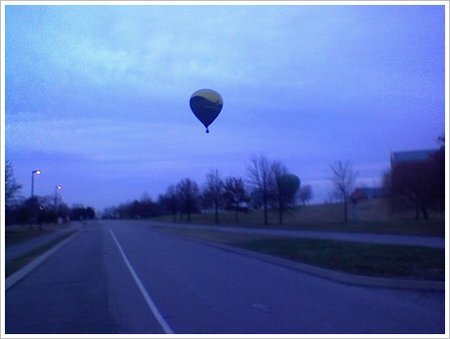 As I was heading into Crockett Park two hot air balloons were lifting off. (The second balloon is behind the tree, barely off the ground.) The temperature was in the mid-30s. It had to be a cold ride for the first day of winter. The training the St. Jude’s Marathon is done. It was a good week and what made it even better was that I was on vacation. With the office closed Thursday and Friday, Thanksgiving week is always a good time to get a week off and only use three vacation days. Monday was 7 miles with 8 x 100m strides. Tuesday, I ran 8 miles. Thursday, Amy and I ran the Habitot 5k and then I ran 2 additional miles when I got back to the house. Friday was another rest day. Saturday I ran 12 miles. Now it is just a couple of easy runs this week and then head for Memphis on Friday. At this point, the weather looks great, overnight lows in the mid-30s and the high in the low 50s and dry. Hope the forecast holds for the next 7 days.